Your accommodation is in mounatin huts and gites. The mountain huts in the Piedmont are welcoming with relatively small dormitories. You'll sleep in small shared dormitory style rooms. Blankets are provided so sleeping bags are not required. Some huts have showers. Tasty and filling meals are taken in a large dining room where a great atmosphere prevails. 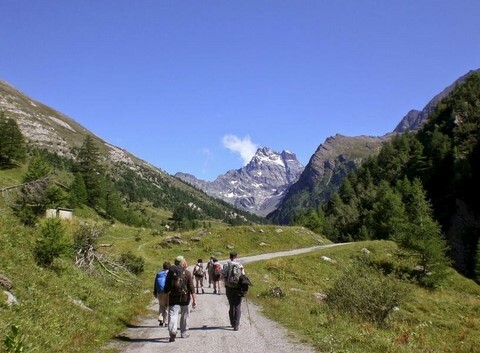 On this independent trekking holiday in the French and Italian Alps you’ll explore the spectacular and wild mountain scenery around Mont Viso, an imposing and relatively isolated peak rising to 3841m in the Piedmont, Italy. You’ll cross between France and Italy among varied mountain scenery, breath-taking panoramas and beautiful lakes. Don’t forget your binoculars, as there are a host of protected species in this beautiful part of the Alps including the famous alpine ibex, chamois, bearded vulture and golden eagle as well as many rare plants. In addition the Lanza Salamander is unique to the slopes around Mont Viso. Your trek around Mont Viso is mainly through Italy but it starts and ends in the Queyras in France and then takes a circular trail through unspoilt, wild and rocky mountains at the foot of the rock walls surrounding Mont Viso. This spectacular peak is far removed from the crowds elsewhere in certain parts of the Alps and you'll stay in small and welcoming huts in superb isolated locations. This trekking holiday is ideal for those who like relatively high altitude walking, in high mountain landscapes, in a quiet and beautiful region of the Alps. The walks on this independent trekking holiday are challenging due to the length and height gain of some of the walking days. Average days are about 6-7 hours long and include height gains of between 350m and 1250m. In addition, most walks will take place between 2000m and 3000m where the effects of altitude can be felt. A good level of fitness is required, and you should be comfortable on mountainous paths which are sometimes exposed and not always well marked. Walking experience in the mountains is necessary. You should be able to navigate in case of poor visibility, which can occur due to local low cloud in the Piedmont known as Nebbia. The difficulty of this holiday is increased due to carrying your own gear and some long days. Early in the season, ie in June, you could experience snow at some of the higher alpine passes and summits. Welcome in Queyras, France or transfer from Montdauphin-Guillestre train station to your gite. Climb to a pass on the Italian border where you'll have your first views of the mighty summit of Mont Viso. Descend into the wonderful Val Pellice via an old military track. Here, traditional alpine grazing or alpage still exists and they still make cheese at altitude. Climb a glacial moraine to reach Refuge Granéro by a lake which overlooks the valley. To join the Po Valley you need to go back into France briefly via the Haute Guil Valley to pick up an ancient salt trail used in the Middle Ages, linking Provence and the Piedmont. After having crossed a first mountain pass, you'll climb to higher altitudes back on the Italian border and the Perthuis du Viso. If conditions allow you can traverse this small tunnel 75m long built in 1480 at an altitude of 2900m (using your head torch!). If not a 2nd pass takes you into Italy. After a descent, a final steep climb in the heart of a pretty valley leads you to your mountain hut or rifugio. Today you have an easier day traversing the Eastern slopes of Mont Viso allowing your legs to recover after the efforts of your first two days walks. It nonetheless crosses 2 passes, visits 7 lakes and there is also an option of a 3000m summit— Viso Mozzo! You'll undertake a pretty descent towards the lakes before climbing the moraines of the Glacier Noir of Mont Viso with dramatic walking between the 1200m high walls of Mont Viso and the western slopes of Visso Mozzo. This passage is reminiscent of crossing a Himalayan pass in terms of scale and situation. On your approach to Col du Viso you can climb the summit of Viso Mozzo at more than 3000m before joining your refuge. After crossing the rocky slopes of pass San Chiafredo (2762m), a long descent leads you to Val Varaita and its immense forests of Arolla Pine. You can admire the south face of Mont Viso and the immense plains of Po. Once in the lower valley you'll climb alongside a beautiful mountain torrent, through alpage to the sounds of cow bells. You'll reach the foot of the immense west face of Mont Viso and your refuge at 2500m on the edge of a lake. An easier day to explore the most beautiful historic village of the Italian Piedmont, Chianale. A short climb to a panoramic col where ibex and chamois are often spotted. From here it's possible to climb to the summit of Punta Losetta at 3042m where you'll discover a wonderful view of Mont Viso. Back at the pass, descend the long Vallon di Soustra to reach the pretty village of Chianale. Discover its pretty alleys with traditional houses, chapels and a museum. A wonderful climb in the Dell Antolina alpage. You’ll discover several lakes during the day as you climb through alpine pasture. Depending on how you are feeling once at Laghi Blue (2560m) you have the choice between 2 trails. Either you can go direct to the French-Italian border via the western ridge of Rocca Bianca or a longer tour of Tete des Toillies (which we recommend) to reach your refuge by a lake. A beautiful traverse for your last day of your trek which takes you back to your starting point. 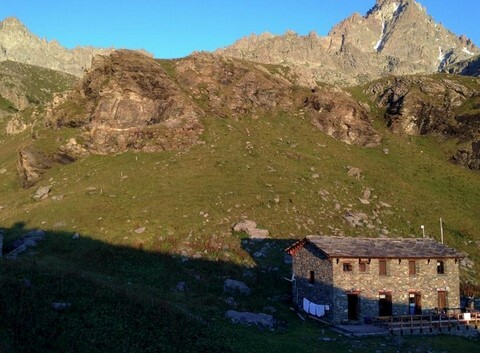 From the hut it is a short climb to Col Saint Veran and then Col Chamoussière with the option of climbing Pic Caramantran at over 3000m for wonderful views of the giants of the Alps, including Mont Blanc, Mont Rosa and the Matterhorn. After a descent to Refuge Agnel, climb to Col Vieux (2806m) at the foot of the impressive Pain du Sucre. From here it's a long but spectacular descent along the Bouchouse Valley. You'll pass a couple of beautiful alpine lakes before joining the Guil Valley and the end of your magnificent alpine trek. Your accommodation is in mountain huts or refuge (rifugio in Italian) and a gite at the start of the trekking holiday in the Alps. The huts in the Italian Piedmont are welcoming and have relatively small dormitories. On this trek they are in some great locations. You'll sleep in shared small dormitory style rooms. Many huts have showers (at your own cost). Dinner is taken in a dining room with other walkers in a convivial atmosphere and the surroundings are magical. Your lunches are not included in the price. You can buy your lunches from your accommodation by ordering the evening before. Sometimes you can buy lunch at a hut along the trail. Transfers between Mont Dauphin - Guillestre train station and the first accommodation and the return can be included in holiday price if required. Eurostar and the TGV provide a relaxing journey from London to Lyon Part Dieu via Lille or direct. From Lyon you'll need to take local train services to the Mont Dauphin - Guillestre station, changing at Grenoble. Some trains go direct to Guillestre from Grenoble, whilst others require a further change. The section between Grenoble and Guillestre takes a minimum of 3hrs. Recommended times if travelling all in one day: Leaving London at 9am arriving in Lyon 3pm. Leaving Lyon at 4pm and arriving at Mont Dauphin at 9pm (times approx). You can also take trains from Lyon to Valence and change at Valence going via Gap. Flights from the UK to Lyon St Exupery, then bus (Satobus) or tram to Lyon Part Dieu. Train then as detailed above. 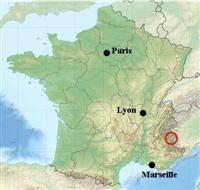 Possibility to fly into other airports such as Marseille and then take the train from Marseille St Charles. Once in France, the journey from Calais to the Queyras takes about 12 hours (excluding long breaks). Tolls amount to about 50 euros each way. Channel crossings are provided by the following companies. Parking available at first accommodation.